© 2002, © 2018 by Paul Freeman. Revised 5/21/18. 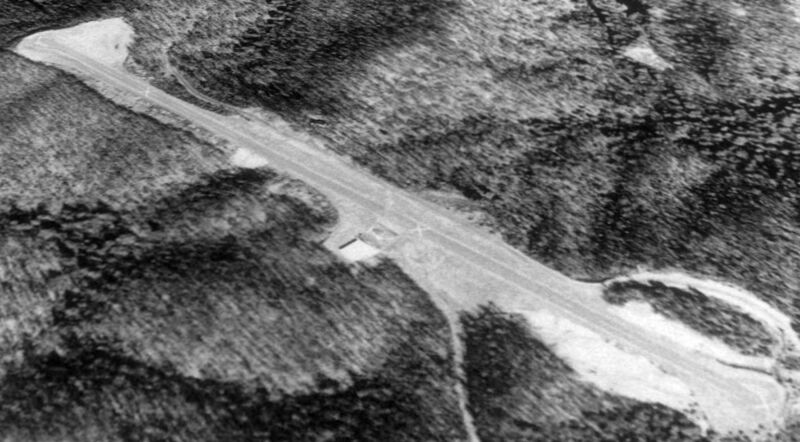 A 10/7/64 USGS aerial view of Brevard Airport. 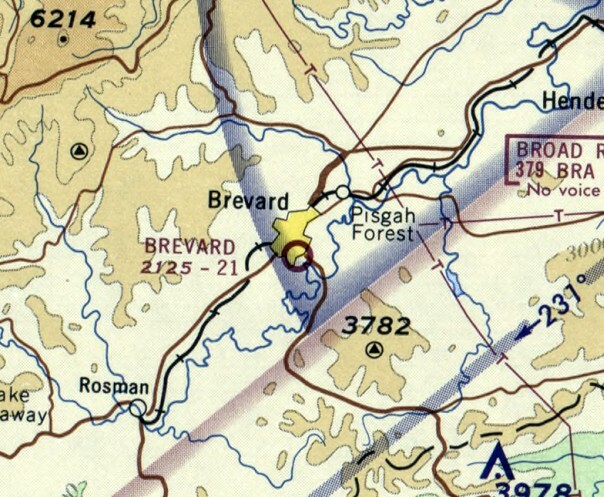 According to its FAA Airport/Facility Directory data, Brevard Airport was activated in April 1962. 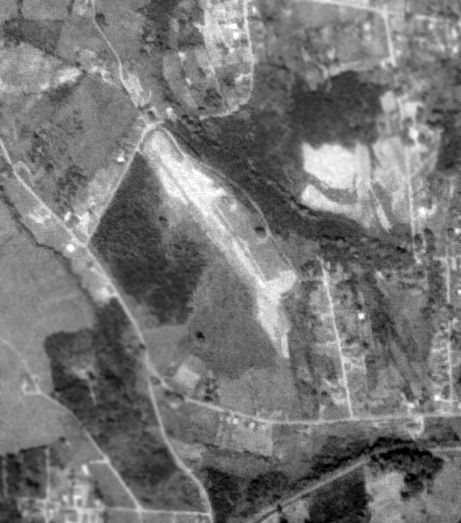 The earliest photo which has been located of Brevard Airport was a 10/7/64 USGS aerial view. 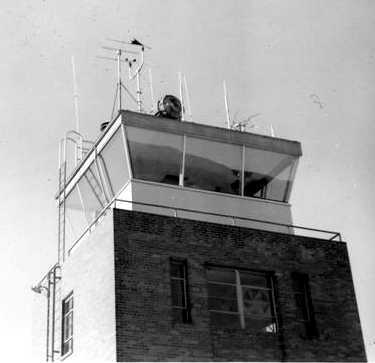 with 7 T-hangars & one light single-engine aircraft on the northeast side. with a few small buildings on the northeast side. was on the April 1965 Charlotte Sectional Chart. 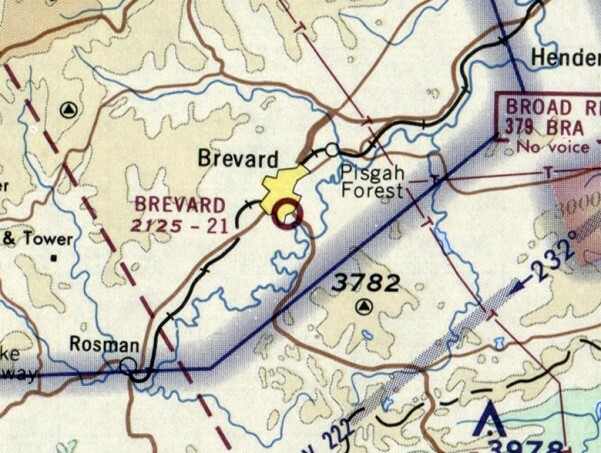 It depicted Brevard as a public-use airport having a 2,100' unpaved runway. 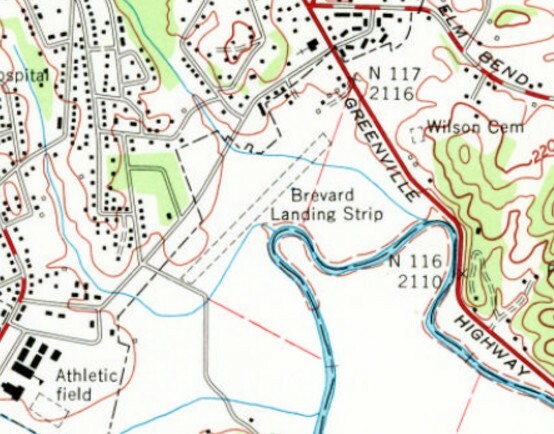 The October 1968 Charlotte Sectional Chart depicted Brevard as a public-use airport having a 2,100' unpaved runway. which showed one light single-engine aircraft parked on the northeast side. The multiple T-hangars had been replaced by one slightly larger hangar at some point between 1964-2008. A 2015 aerial view looking west showed Brevard Airport remained intact, but devoid of aircraft. and being owned & managed by Valley Auto Sales. 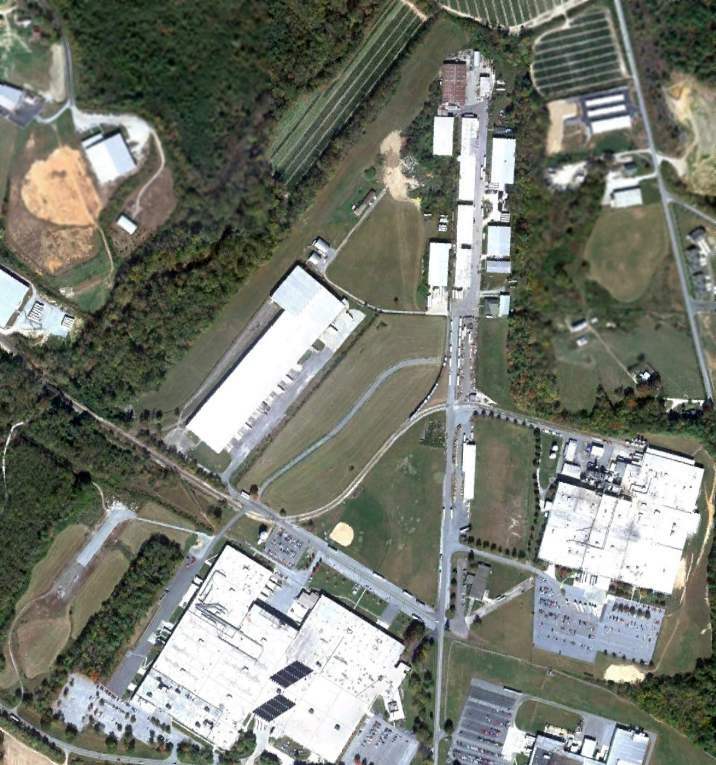 Brevard Airport is located south of the intersection of Gallimore Road & Greenville Highway. Thanks to Larry Kindrick for pointing out this airfield. A 2009 aerial view looking southwest at Skyline Peak Airport. 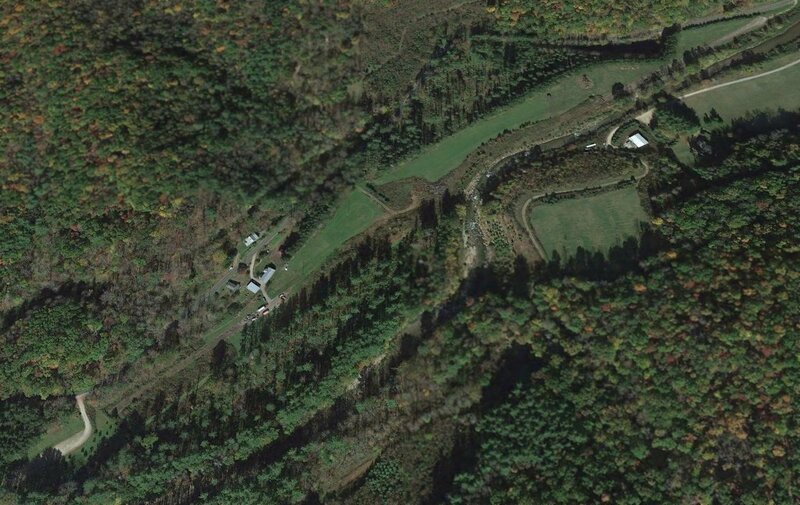 was evidently built in connection with the Wolf Ridge ski resort, located a half-mile to the northeast. 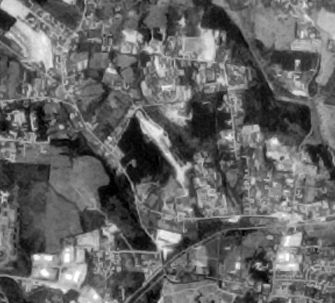 A 2002 aerial photo showed the mountain before any airfield construction. with progressively more mountainside being carved away through a series of photos up through 2008. The FAA Airport/Facility Directory described Skyline Peak Airport as being activated in June 2009. 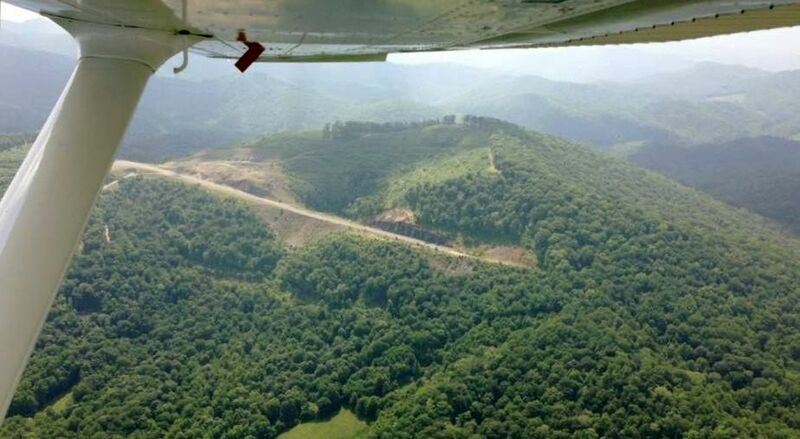 The earliest photo which has been located showing Skyline Peak Airport's completed runway was a 2009 aerial view looking southwest. with an asphalt ramp & a small building on the northeast side. 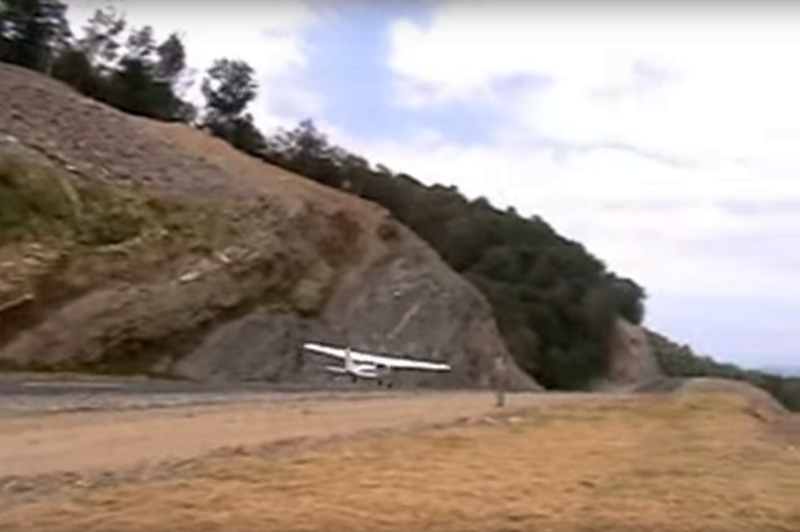 A circa 2010 photo looking east at a Cessna 172 on final approach to was supposedly the first & only landing at Skyline Peak Airport. 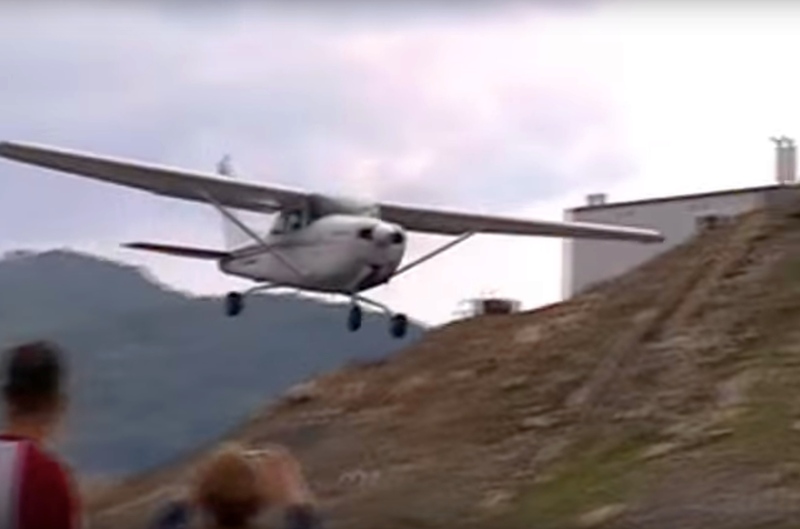 A circa 2010 photo looking southwest at a Cessna 172 just before touchdown at was supposedly the first & only landing at Skyline Peak Airport. Notice the multiple rock walls directly adjacent to the runway, where the strip was excavated from the mountainside. 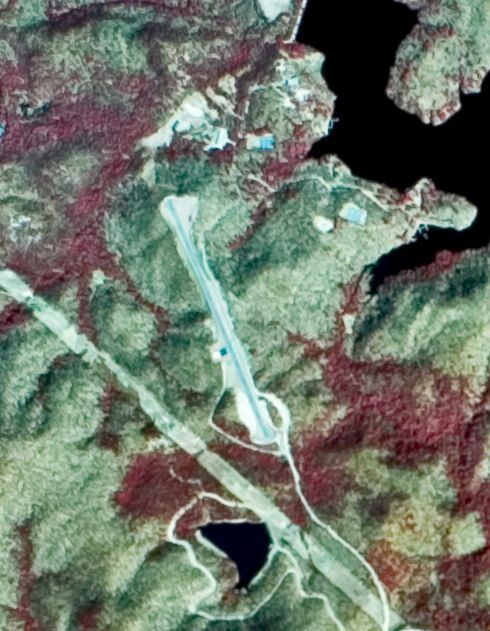 The last photo which has been located showing Skyline Peak Airport still marked with active-runway markings was a 2010 aerial view looking southwest. as a 2013 aerial view showed closed-runway “X” symbols pained on both runway ends. A 2015 aerial view looking southwest at Skyline Peak Airport, showing closed-runway “X” symbols pained on both runway ends. A 2015 aerial view looking southeast at Skyline Peak Airport. depicted with a single paved 3,300' southwest/northeast runway. 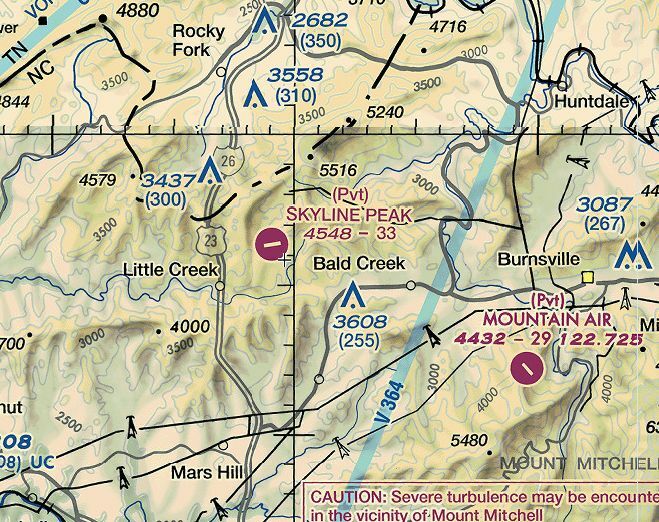 Even though it was still depicted on the 2016 Sectional Charts, as of 2016 the FAA Airport/Facility Directory data listed Skyline Peak Airport as “Closed indefinitely”. and to have one single-engine aircraft based on the field (although none of the pictures show a based aircraft or any hangar). It was said to be owned by TW Ventures, and the manager listed as K. Sebok. 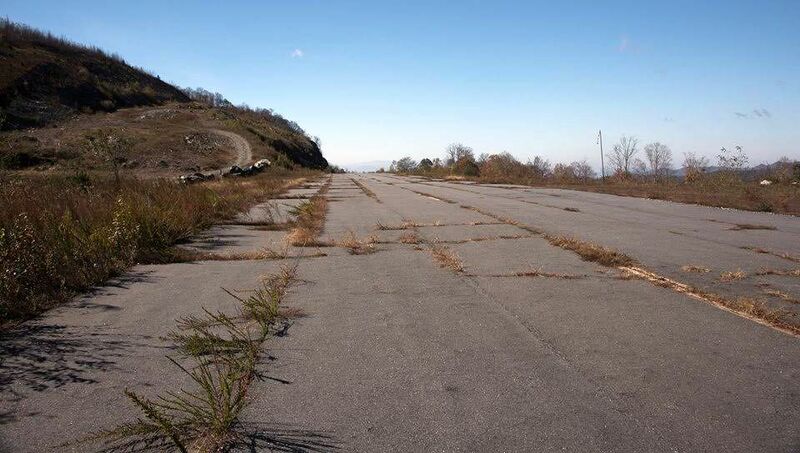 A 2011-2016 photo looking west along the cracked & weed-strewn runway pavement of Skyline Peak Airport. Skyline Peak Airport is located south of the intersection of Wolf Ridge Road & Airport Road, appropriately enough. Thanks to Rick Harshbarger for pointing out this airfield. 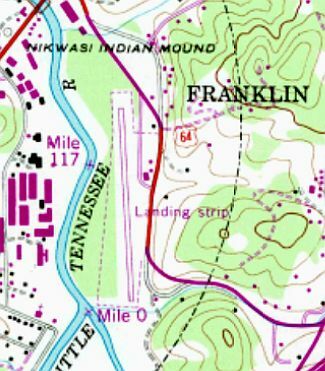 Fields of the Wood Airfield, as depicted on the 1978 USGS topo map. The date of establishment of this private airfield has not been determined. 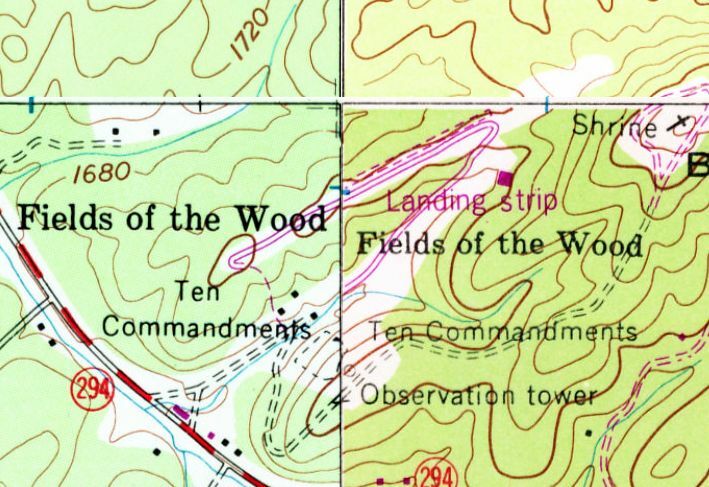 The earliest depiction which has been located of the Fields of the Wood Airfield was on the 1978 USGS topo map. 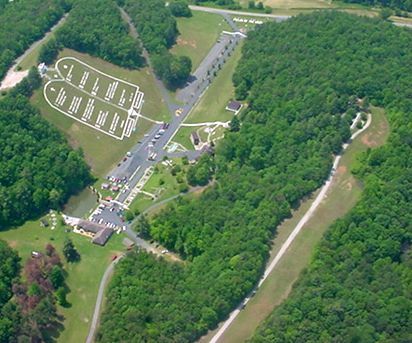 It depicted a northeast/southwest runway, labeled simply as “Landing Strip”. According to Wes Floyd, “Its located at a Bible Park called 'Fields of the Wood', operated by the Church of God. The headquarters for the church was in Cleveland TN & I read that the guy who ran the church flew back & forth. A 1992 aerial view looking southwest at the Fields of the Wood Airfield. 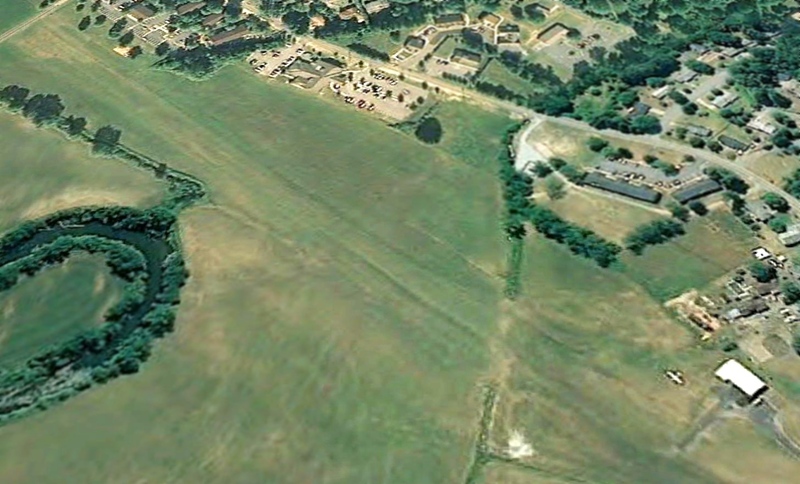 A 2002 aerial view by Wed Floyd looking southwest at the Fields of the Wood Airfield (bottom-right). A circa 2010 aerial view looking north at the Fields of the Wood Airfield. A 2014 aerial view looking southwest at the Fields of the Wood Airfield shows that the northeast portion was paved, and the remainder grass. A 2015 photo (courtesy of Wes Floyd) of an Aeronca Champ on display at the Fields of the Wood bible park adjacent to its airfield. Wes Floyd recalled, “The airplane (a Champ) was on display there when I was a teenager. Then It was moved. It is not known at what point the Fields of the Wood Airfield was closed. As of 2015 the Fields of the Wood Airfield is no longer registered with the FAA. A 6/21/15 photo by Wes Floyd of an Aeronca Champ on display at the Fields of the Wood bible park adjacent to its airfield. 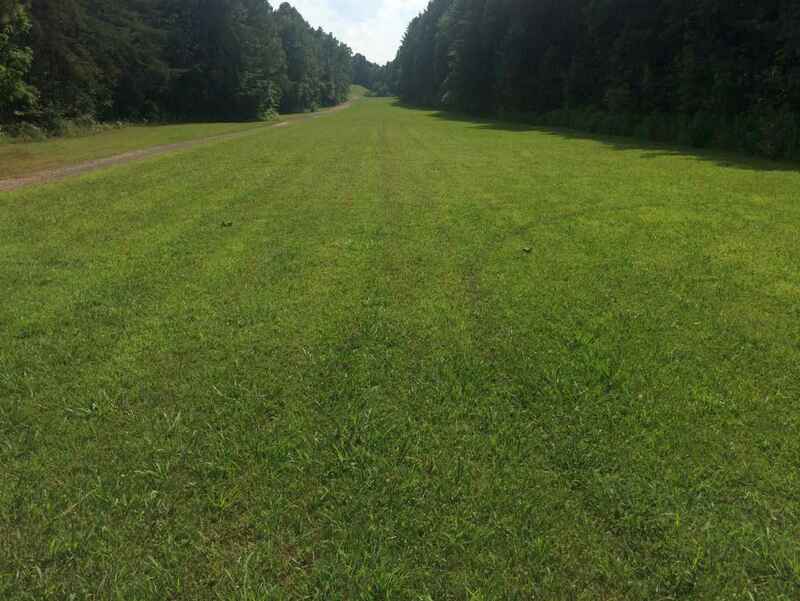 A 6/21/15 photo by Wes Floyd looking east along the paved portion of the Fields of the Wood runway. A 6/21/15 photo by Wes Floyd looking west along the grass portion of the Fields of the Wood runway. Fields of the Woods Airfield is located northwest of the intersection of Route 294 & Shenandoah Road. Thanks to Wes Floyd for pointing out this airfield. A 6/19/1919 photo of a Curtis JN-4 Jenny marked “Asheville” at Baird Bottom Landing Strip (from the Pack Memorial Library, via Dallam Oliver-Lee). Lincoln Beachey ceremoniously flew into Asheville to show off his famous aerial stunts over Baird Bottom for the citizens of Asheville. This flight was one of his pioneering flights over the mountains of Western North Carolina. That day, although for a brief moment in aviation history, Baird Bottom was Asheville's first unofficial airport. was a 6/19/1919 photo of a Curtis JN-4 Jenny marked “Asheville” (from the Pack Memorial Library, via Dallam Oliver-Lee). According to Dallam Oliver-Lee, “In the 6/19/1919 picture, Henry Westall prepares to take off from Baird’s Bottom in his plane the Asheville. Westall was an army Signal Corps pilot in World War I & started a commercial aviation business here in 1919 with shares selling for $50 each. 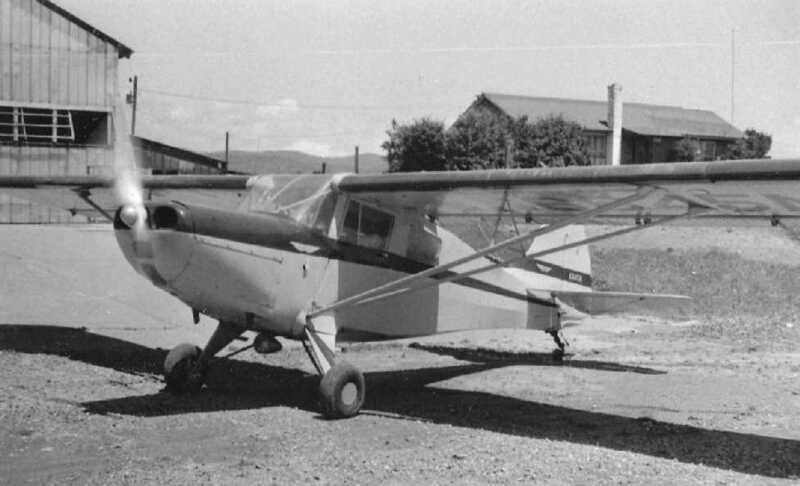 He purchased a surplus Canadian training plane & some parts, and 'voila' the Asheville Aerial Corporation was in business. Rides over Asheville were available for $15, a hefty sum at the time. Also in 1919 Westall was the first aviator to fly over the Blue Ridge. It took him less than an hour to fly from Asheville to Morganton, NC. The rest of the story, is hearsay, but interesting. 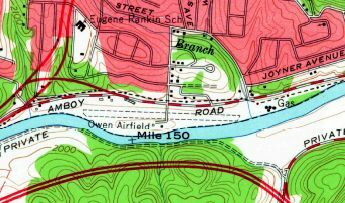 Baird Bottom Landing Strip was not depicted at all on the 1920 USGS topo map. which was constructed by Charles Waddell & Company. 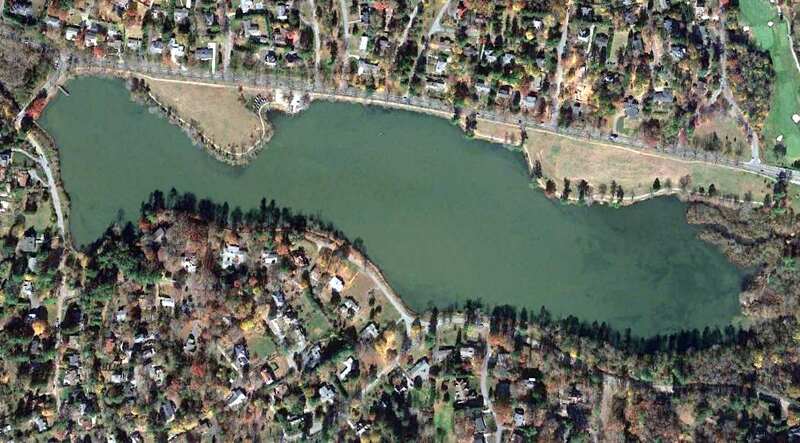 A 2013 aerial photo (courtesy of Dallam Oliver-Lee) showed the site of Baird Bottom Landing Strip covered by Beaver Lake. The site of Baird Bottom Landing Strip is located south of the intersection of Merrimon Avenue & Marlborough Road. 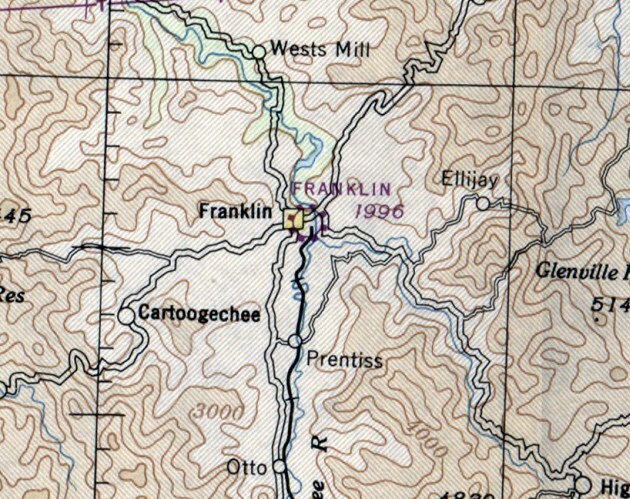 Franklin Airport, as depicted on the October 1946 Charlotte Sectional Chart. nor on the April 1945 Charlotte Sectional Chart. which depicted Franklin as a commercial/municipal airport. with a single small building on the northeast side. 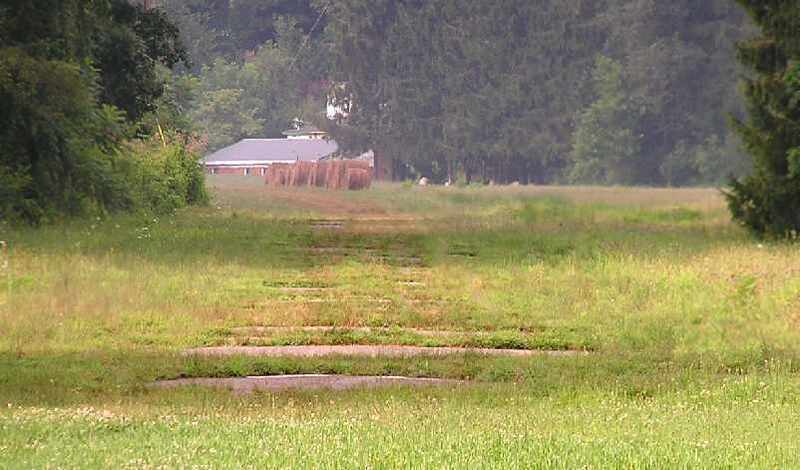 depicted Franklin Airport as having a single unpaved 2,700' Runway 18/36, with 2 small buildings on the east side. was on the October 1968 Charlotte Sectional Chart. It depicted Franklin as having a 2,700' unpaved runway. The earliest photo which has been located showing Franklin Airport was a 4/12/75 USGS aerial view (courtesy of Dallam Oliver-Lee). It depicted Franklin Airport as having a single north/south runway. 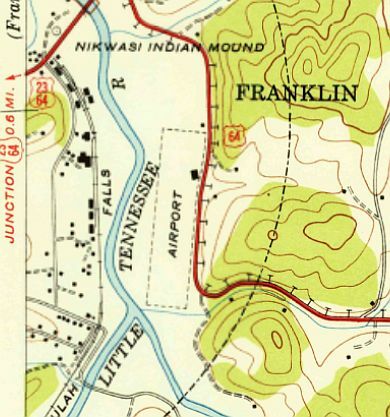 The last labeled depiction which has been located of Franklin Airport was on the 1978 USGS topo map. as the 4/1/94 USGS aerial photo (courtesy of Dallam Oliver-Lee) depicted the runway as being overgrown. A 3/18/13 aerial photo (courtesy of Dallam Oliver-Lee) still showed a barely recognizable trace of the Franklin Airport runway. 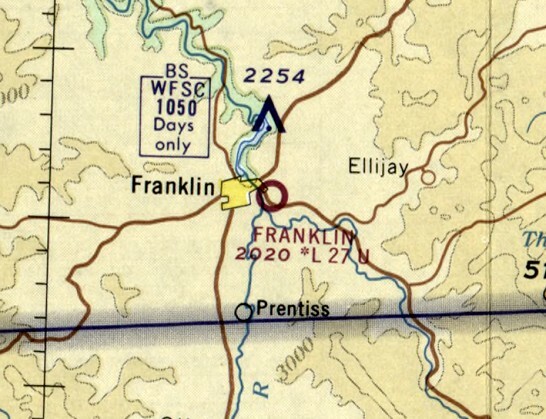 The site of Franklin Airport is located west of the intersection of Route 28 & Thomas Heights Road. "Owens" Field, as depicted on the October 1948 Charlotte Sectional Chart (courtesy of Chris Kennedy). as it was not yet depicted on the 1943 USGS topo map nor on the April 1946 Charlotte Sectional Chart (according to Chris Kennedy). which depicted "Owens" as a commercial or municipal airport. this would have been in the late 1940s or early 1950s. as having a 3,000' unpaved runway. “made from a Bruner-Winkler Bird biplane that belonged to my flight instructor, George Marshall. I learned to fly at Owen Field in the summer of 1955. That sure was the good old days. A 1957 photo by James Brown of “a Waco UPF-7 parked at Owen Field, while being rebuilt by Jack McMinn. and Doc Owens, George Marshall, and the crowds that would fill the airport with their cars, for an acrobatic show from my father. I can remember the days my dad flew his plane & was always in the air. I did go up several times, but I didn't like being turned upside down, all of the time... ha! 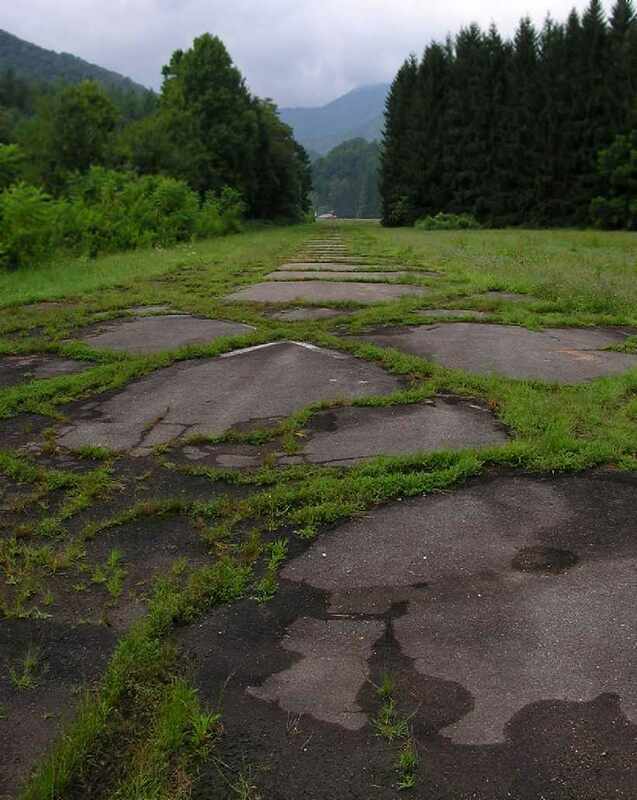 and the racetrack which had been built over the middle of the runway. David recalled, “I raced at the speedway for 7 years. with a single small building on the south side. "Owen" Field, as depicted on the January 1961 Charlotte Sectional Chart (courtesy of Chris Kennedy). and listed the operator as Dr. J. E. Owen. as it was no longer depicted on the May 1963 Charlotte Sectional Chart (according to Chris Kennedy). The last labeled depiction which has been located of Owen Field was on the 1964 USGS topo map (courtesy of Dallam Oliver-Lee). but the remains of the majority of the runway still extended out in both directions. What may have been a former hangar was visible on the northwest side. By the time of the 1972 USGS topo map, Owen Field was no longer depicted. A 4/26/84 USGS aerial photo (courtesy of Dallam Oliver-Lee) showed that the western end of the Owen Field runway had been replaced by a parking lot. The history of this property took another turn in 1999 when the Asheville Motor Speedway was closed. 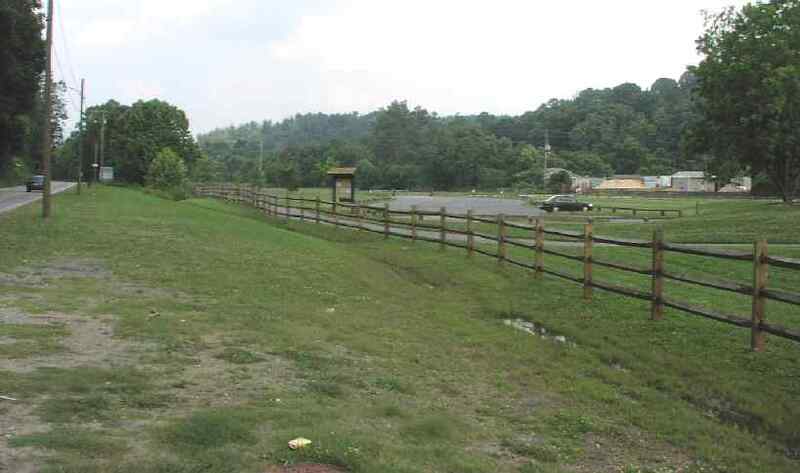 and then gave the land to the City of Asheville for a new riverside park. so the city would be free to modify or remove them as it saw fit. However, the majority of the former speedway has remained intact, reused as a bicycling velodrome. The facility is known as the French Broad River Park. with the majority of the runway still recognizable to the east of the racetrack. A 2004 photo by William Stephens, looking east along what would have been one of the final approach paths to Owen Field. of the site's history as either an airfield or a speedway. William Stephens visited the site of Owen Field in 2004. "The only thing they did was go around & replace the red & white stripes on the guardrails & concession stand green & white. with the speakers for the P.A. system still attached. Alas, they did not leave a trace of the airstrip. 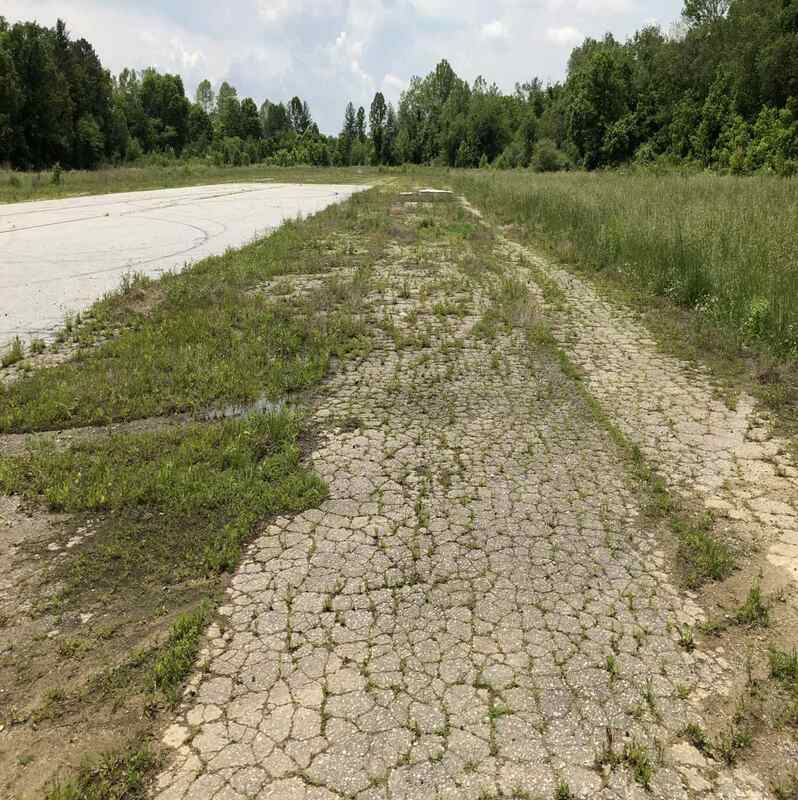 (a long, straight stretch of asphalt that ran right up to the outer east wall of the speedway)." Nick Sandin reported in 2006, “I recently had the opportunity to visit the former site of Owen Field. (according to my friend, a construction expert, who was with me at the time). A 10/20/10 aerial photo (courtesy of Dallam Oliver-Lee) showed no remaining trace of Owen Field. The site of Owen Field is located south of the intersection of Amboy Road & Short Michigan Avenue. Thanks to William Stephens for pointing out this airfield. Josephson Airport, as depicted on the April 1946 Charlotte Sectional Chart (courtesy of Chris Kennedy). The date of construction of Emma Airpark has not been deteremined. which indicated that “Emma Air Park was a 14 acre tract of land located a half mile west of Emma. On 1/24/28, Harry Brooks, Henry Ford’s test pilot, attempted to fly from Ford Field in Dearborn, MI to Miami, FL. 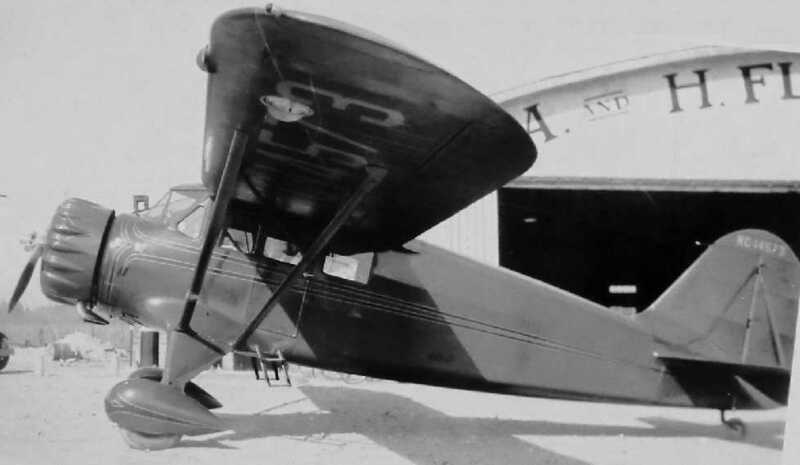 although Brooks did set a non-stop distance record in his small, single seat, 36 horsepower plane. nor depicted on the October 1945 Charlotte Sectional Chart. was on the April 1946 Charlotte Sectional Chart (courtesy of Chris Kennedy). It depicted “Josephson” as an auxiliary airfield. A summer 1948 photo (courtesy of Bob Gilbert) of Bob flying 2 passengers in a Waco UPF-7, “Big Sid” at Emma Airpark. Bob recalled. “At the time I was working for Joe Josephson and I was hauling 2 passengers on a Sunday. You can barely see the tops of their heads in the front cockpit. [It was] taken at Asheville Airpark aka Emma Airpark. That is the main hangar in the background (galvanized steel & no door) & the little 'terminal' building on the hill. Those 2 Champs are factory new. The Waco, the 2 Champs, and an old Cub comprised the whole fleet. The Waco had recently been assembled from new parts that came crated (surplus I guess because it was really a YPT-14), and was covered at the airpark. That was just before I came aboard. Josephson had hoped to qualify the field for a G.I. program but could not squeeze enough length out of the runway to meet the minimum requirements. next to 2 Stearman biplanes & a Piper J3 Cub at Emma Airpark (from the Pack Memorial Library, via Dallam Oliver-Lee). 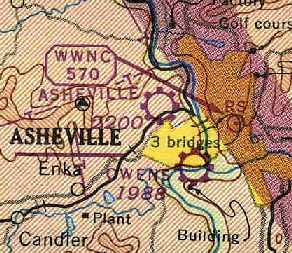 depicted "Asheville" as a commercial or municipal airport. Allen Smith recalled, “This is my recollection of Emma Airport from about 1948 to 1960. Joe Josephson (an enterprising gumball machine supplier) leased the property from Attorney Ellis Jones for 99 years. 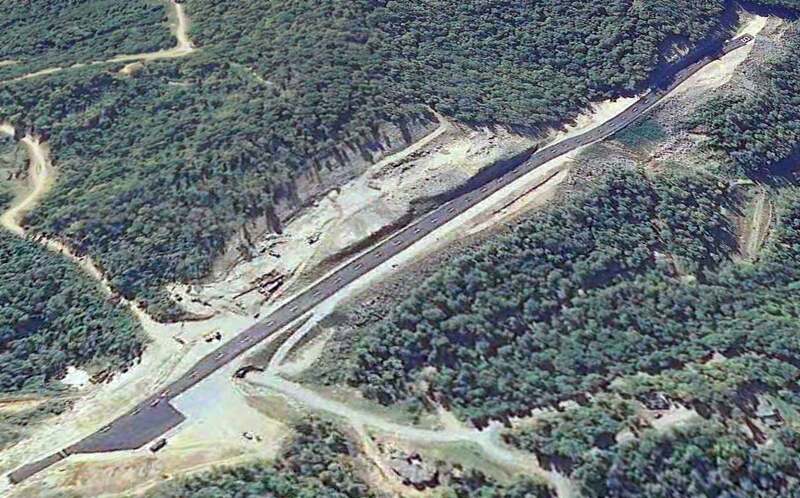 after it had been cut in the hillside & it measured just under 1,800' from end to end. The southeast side was bounded by 2 fenced cow pastures where Mrs. Jones kept her milk cows. Allen continued, “The southeast side end of the runway ended in a small drop off of scrub trees, vines & weeds. The north side dropped of to a creek but was not part of the airport. The west end dropped off almost directly onto what I always thought was brickyard road. A road was cut into the property around the northwest end so all car traffic could come from that direction. It was the only way in & out of Emma Airport unless one flew in or out. and one area was where a full-time airplane mechanic worked on engines & made repairs to airplanes. Mr. Josephson personally told me that he invented the cantilivator door & it could be opened or closed by a small child. Allen continued, “Mr. Josephson also built about 10 covered hangars to rent to pilots who owned their own airplanes. Eventually a fuel pump was installed & pilots could buy fuel & other needed items. and had a snack bar & eventually a license to sell beer. It also had a couple of pinball machines. so he could water the new seed & eventually the grass that grew with the 20' or so telescoping dispenser. By doing this he could make about 5 passes & water the whole airport. Same thing when he cut the grass. He also seeded the bank & grew grass so that the people who would come to the airshows would have a place to sit. Just to the east of the terminal was a huge oak, one of 4 planted in the late 1800s in the shape of a diamond. Allen continued, “As a young boy I helped a pilot apply new fabric skin to his biplane. A number of other boy us 10 or 12 helped glue the canvas on & painted it. The airplane was named 'BIG SID'. Allen continued, “Mr. Josephson had many airshows there & I worked for him as a few other regular boys he knew did. He would tie white aprons with big pockets in front with a hand-written sign on the front listing the price of admission. I remember there were times when the pockets were so full that money would fall out. with a big gallon jug or cloth sack & collect most of the money only leaving enough so we could make change. He was a good man though as he always gave us $5 after the show for about 2 hours work. confused it with Emma & landed at Emma Airport. The plane was completely loaded with baby chicks & after the pilot landed he realized the runway was too short to take off. 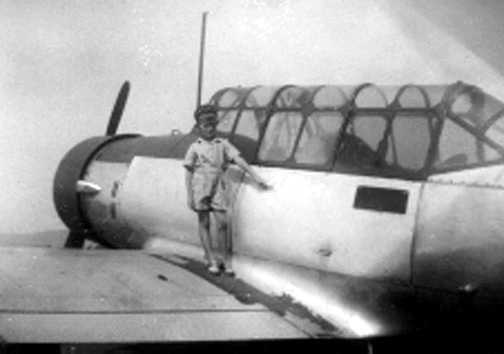 A circa 1948 photo of Allen Smith atop the wing of an Air Force Vultee BT-13 Valiant trainer at Emma Airpark. Allen recalled, “Another time 6 Air Force pilots circled the airport with what turned out to be trainers. They finally landed & asked where the terminal was? Some of us kids told them that the small building was the terminal & the Air Force pilots just laughed. They quickly departed after calling Asheville taxicabs. The planes set there & over the years deteriorated never to be flown again. I can only assume that after the war was over the Air Force just flew these planes into smaller upcoming new airports with no intention of ever moving them. and every kid within half a mile or so ran to the airport to watch them land & taxi up to where they were first lined up. Smoke billowing out of the big engines & the noise was unbelievable. As children this was the closest to the war we could ever hope to get. Allen continued, “I only recall 2 crashes at Emma Airport. and flipped into the pine trees to the south just missing one of the big oaks I described earlier. and went off the end of the west end & broke in half. hand-made some signs & parked about 50 or 60 cars into the area charging 50 cents each. Some of the people asked if we would be there to protect them & Leonard assured them we would. Allen continued, “The last & final airshow almost got Mr. Josephnson in trouble with the law. The final act was for a female jumper was to make her first jump... of course the idea was to get the crowd out of the airport. Again I collected money got my $5 & watched the show from the area where all the pretty girls had gathered with their families. The announcer built up the show finale & when the woman jumped her parachute didn't open but sailed further south of the airport. while ambulances had been called to help those few who were thought to be heart attack victims. or it was simply overlooked as a relatively small airfield. Allen Smith recalled, “The airport was also used by one of the traveling circuses in the late 1950s. Also the 800' paved area sprang up when drag racing cars became the big thing in the mid-1950s. At first they drag raced on the dirt but that did not go over very well for the paying public. The 800' foot paved part was strictly built for drag racing & a fence was installed to keep the fans from spilling out onto the paved area. 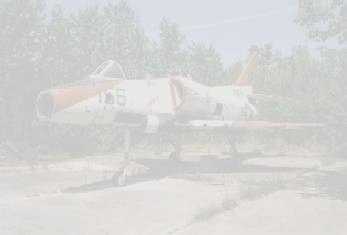 The hangar had been closed down & there were no airplanes there except the remains of the 6 T-6s. where boys & men would gather & work on their cars earlier in the day before the afternoon race. Allen continued, “I was a tall & skinny 14-year old by then & my 11 year old brother was at the airport. and ran the 300 yards or so jumping pasture fences as I had to get there as quick as possible. By then the rain had came in torrents & the lightening seemed to be following the flat 1,800' runway & striking all around. and when I started a number of men were yelling at me to stop & lay down. Hopefully I still had a live brother somewhere in that crowd of people who were there as the storm slowly moved away. and the 2 that had been killed were covered & still laying laying where they fell. That was the end of drag racing at Emma airport & I can only assume that the airport was never used again for any events. 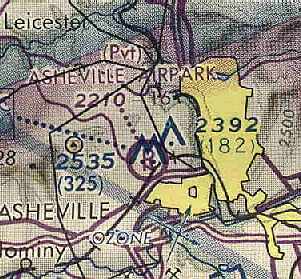 Asheville Airpark was depicted on the 1957 USGS topo map (courtesy of Dallam Oliver-Lee). 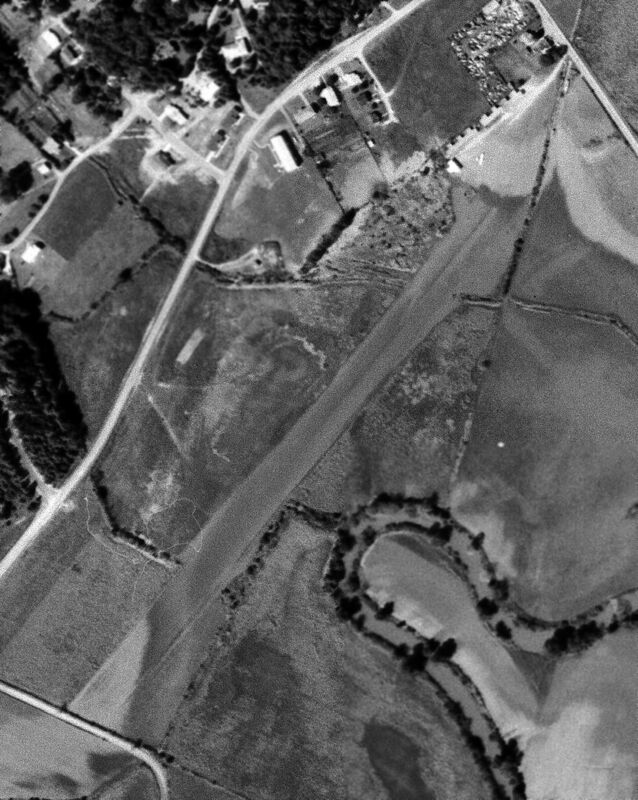 A 1957 aerial view by James Brown looking west at Emma Airpark, showed the field to have a single northwest/southeast runway & a few hangars along the side. B.D. 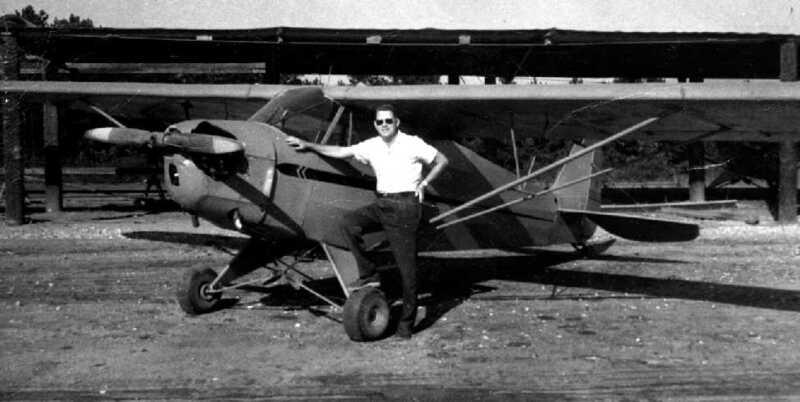 McKay pictured in front of his Piper J-5 Cruiser at Emma Airpark in 1958. 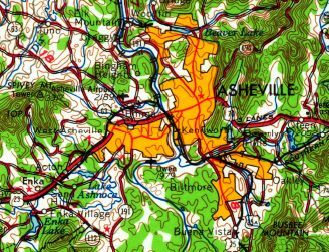 Asheville Airpark was not depicted at all on the 1960 USGS topo map (courtesy of Dallam Oliver-Lee). 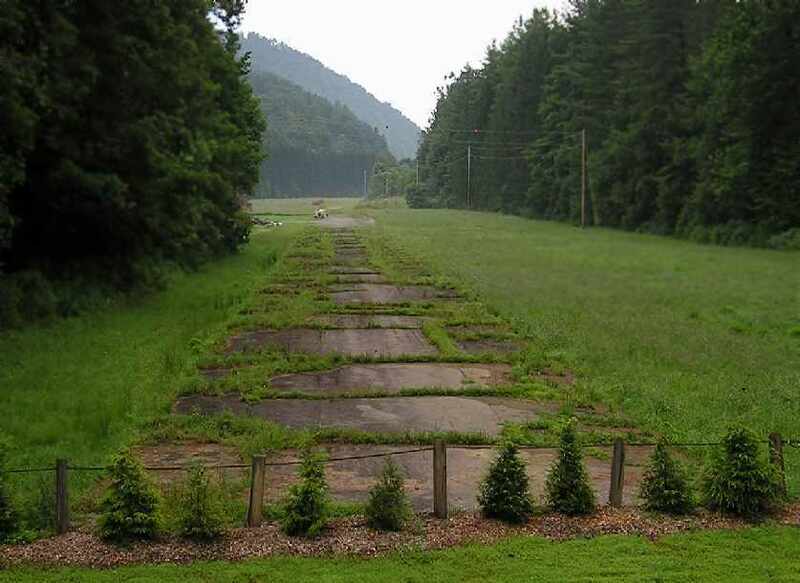 depicted "Asheville Airpark" as a private airfield, having an 1,800' turf runway. with a few small buildings along its periphery. and listed the operator as Joe Josephson. The field had apparently changed from a private to public-use airfield. 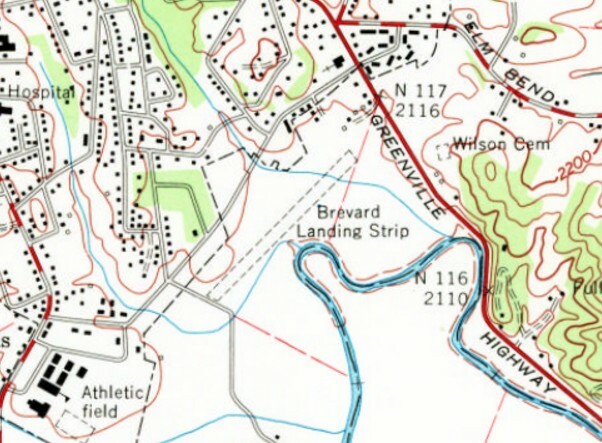 Asheville Airpark, as depicted on the 1964 USGS topo map (courtesy of Dallam Oliver-Lee). 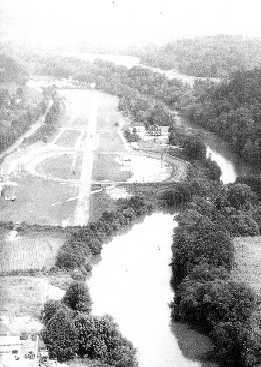 depicted Asheville Airpark as a public-use airfield with a 1,660' turf runway. 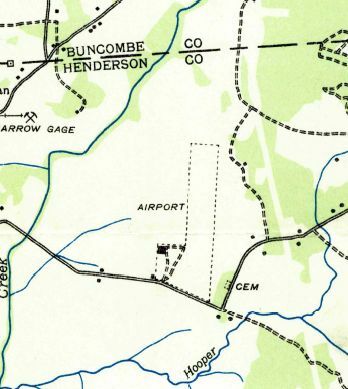 Asheville Airpark was still listed among active airfields in the 1967 NC Airport Directory (according to Paul Cotrufo). 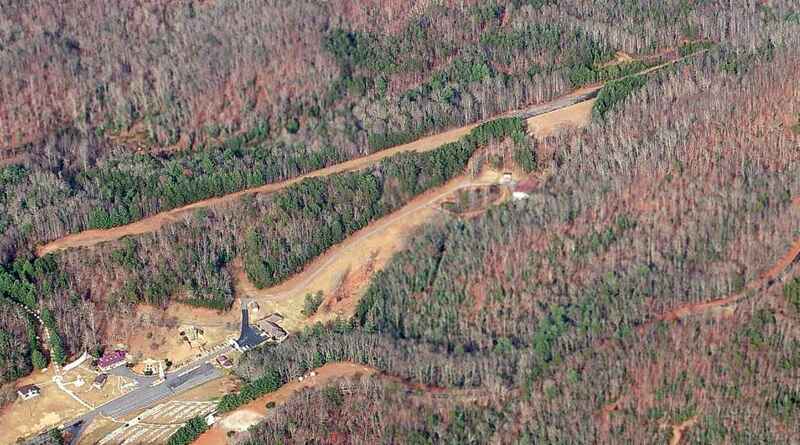 depicted the Asheville Airpark as having a single 1,660' unpaved Runway 14/32, with an inset 800' paved portion. A total of 3 buildings were depicted on the northeast side of the runway. Randy White recalled, “I was a kid in the 1960s & we kept 2 of our airplanes at Emma for a while. We would spend weekends there with other pilots just hanging out. I had always wondered why only 800' of the runway was paved. I landed at Emma on my first lesson as a student pilot. The field was said to be unattended, to be used at "Own risk." HALO team (High Altitude Low Opening) at Ft. Gulick in the former Canal Zone of Panama. putting on exhibition jumps at picnics, airport openings, air shows, carnivals, race tracks, etc. asking that I make two solo jumps at a fund-raising celebration for the Fire Department at the airport. So I jumped from a little Cessna 172, landed just fine, repacked, ate a hot dog or two, then went up to jump again. and asked me if I would take a few minutes to meet someone. I said sure, and they took me over to a little house fronting the airstrip, but lower, at street level. There I was introduced to a sweet little old lady who told me the greatest story. until she heard through the closet walls that the jumper had landed safely from the second jump. A volunteer from the Fire Department, not having seen her all day, came knocking on her door just after my jump. She explained where she'd been & he went to get me. It was one of the most moving & memorable experiences of my career, which included some 3,000 jumps. We prayed again, together with the firefighters, on her front porch. realizing maybe for the first time that even people who didn't know me could care very deeply about me. Paul Cotrufo recalled, "The former Emma Airpark… was at the edge of town in 1976, when I was there. It was a north/south runway, with the north end of the runway butting up to Brickyard road. There never was much too this airport but it sure had a lot of grassroots aviation charm. There was a large cow barn that was the main hangar. 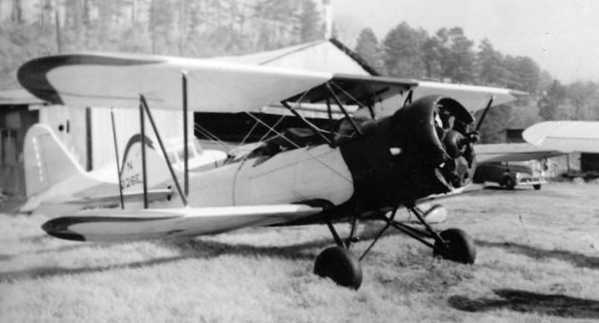 The Asheville Civil Air Patrol kept a couple of L-5s there." once again as a private airfield, still with a 1,600' unpaved runway. as it was no longer listed among active airfields in the 1982 AOPA Airports USA Directory (courtesy of Ed Drury). 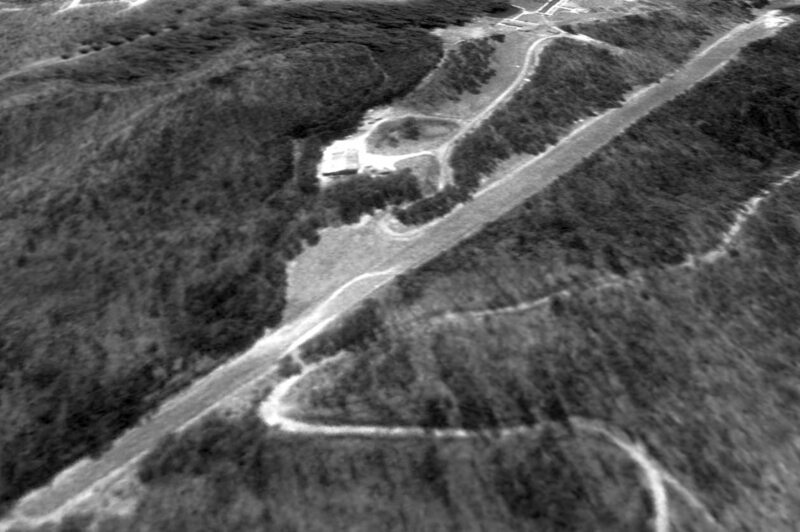 The last photo which has been located showing Emma Airpark still intact was a 4/24/84 USGS aerial photo (courtesy of Dallam Oliver-Lee). rented as such to a fine family who had moved to the area & I became friends with the 2 older children. Later the grounds were used for turkey shoots as they were called. presumably in preparation for new construction. 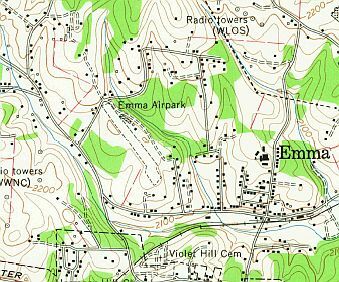 removing any trace of Emma Airpark. but one former hangar remains at the top-center of the photo. 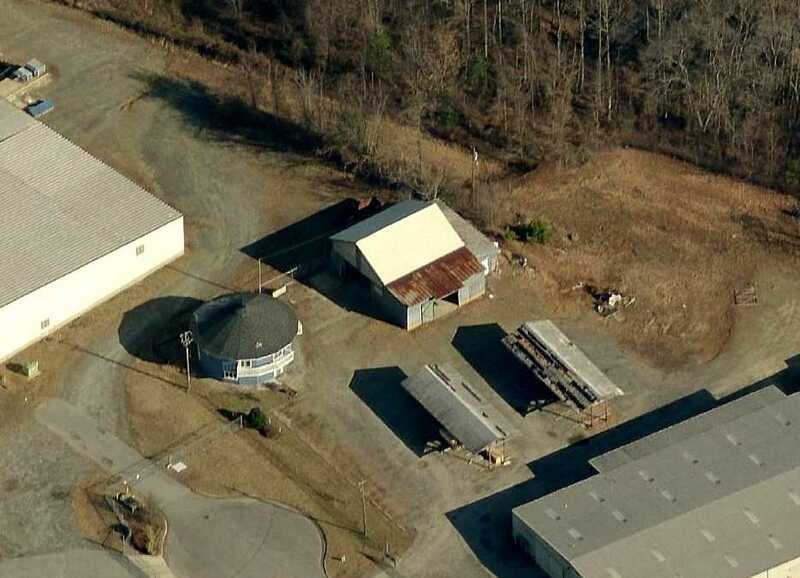 A circa 2010 aerial view looking north at the last trace which remains of Emma Airpark: the circa 1940s hangar. A 2013 photo looking east at the last trace which remains of Emma Airpark: the circa 1940s hangar. A local resident reported in 2013, “I work right beside the old Emma Airpark. I looked at [the] photos of the old hanger, and surprisingly it still exists here on Westside Drive. 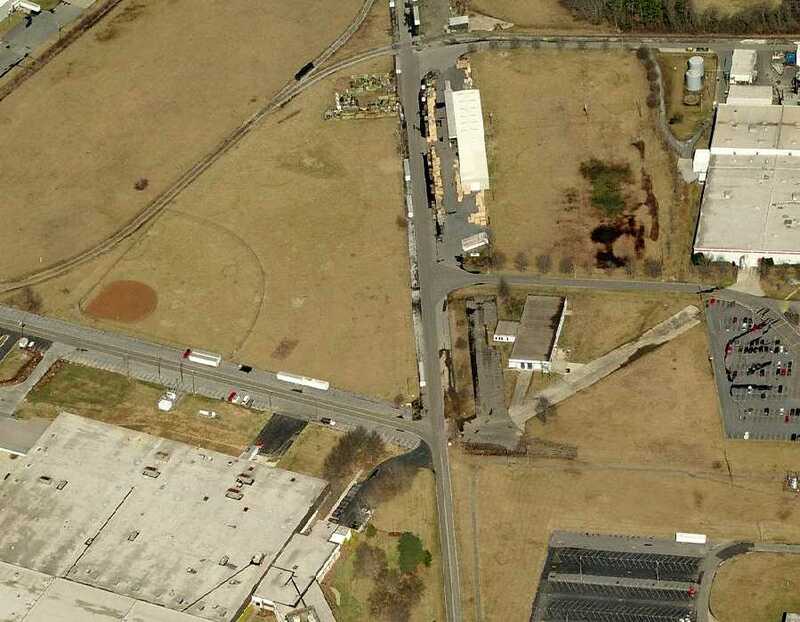 The site of Asheville Airpark is located at the eastern terminus of Airpark Road, appropriately enough. Thanks to Paul Cotrufo for pointing out this airfield. 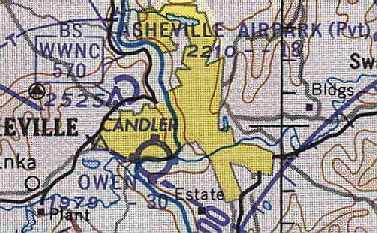 Asheville-Hendersonville Airport, as depicted on the May 1935 Charlotte Sectional Chart. 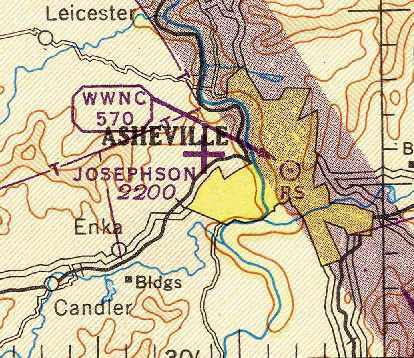 The original Municipal Airport for the town of Asheville was located southeast of the town. 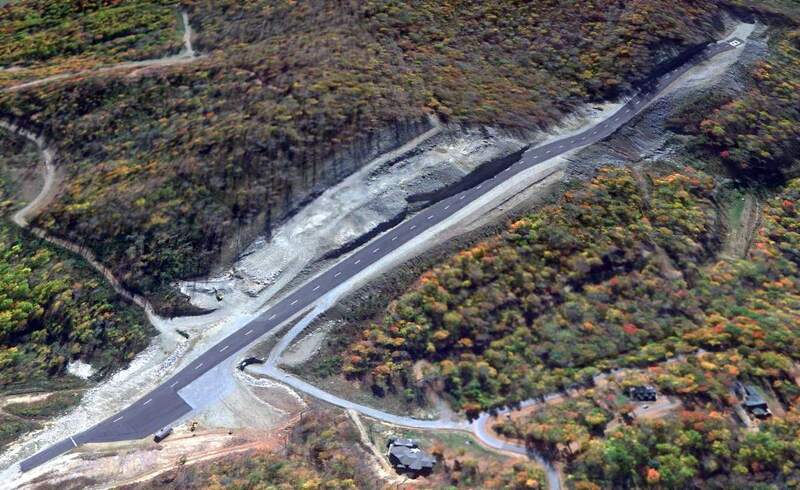 The date of construction of the Asheville-Hendersonville Airport has not been determined. was in the Airport Directory Company's 1933 Airports Directory (courtesy of Chris Kennedy). measuring 3,100' north/south & 1,200' east/west. A hangar was said to have "Asheville Airport" painted on the roof. was on the on the May 1935 Charlotte Sectional Chart. 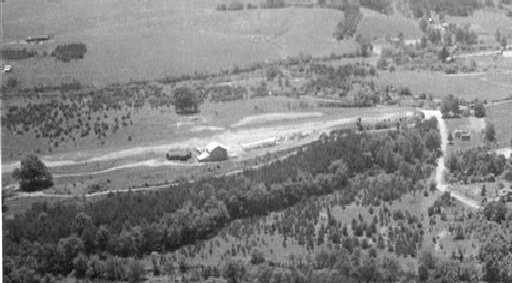 It depicted Asheville-Hendersonville as a commercial/municipal airport. labeled simply as “Airport”, with a few small buildings on the southwest side. was an undated aerial view in the Airport Directory Company's 1937 Airports Directory (courtesy of Bob Rambo). as the directory described it as having 2 "silt-loam" runways, with the longest being a 3,100' north/south strip. A photo (believed to be 1937) showing 8 aircraft around & inside the A&H Flying Service hangar at Asheville-Hendersonville Airport (courtesy of Frank Blazich). 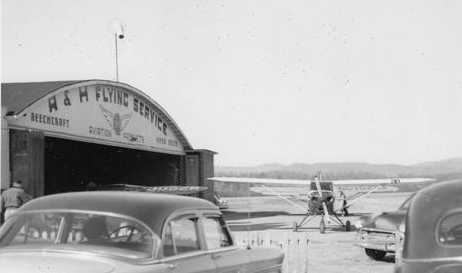 A photo (believed to be 1937) of a Stinson Reliant in front of the A&H Flying Service hangar at Asheville-Hendersonville Airport (courtesy of Frank Blazich). as having 2 runways: a 2,200' east/west paved strip & a 3,200' north/south turf strip. as the 1942 USGS topo map (courtesy of Dallam Oliver-Lee) depicted the field as having 3 unpaved runways. and indicated that both Army & Navy flight operations were conducted from the field. 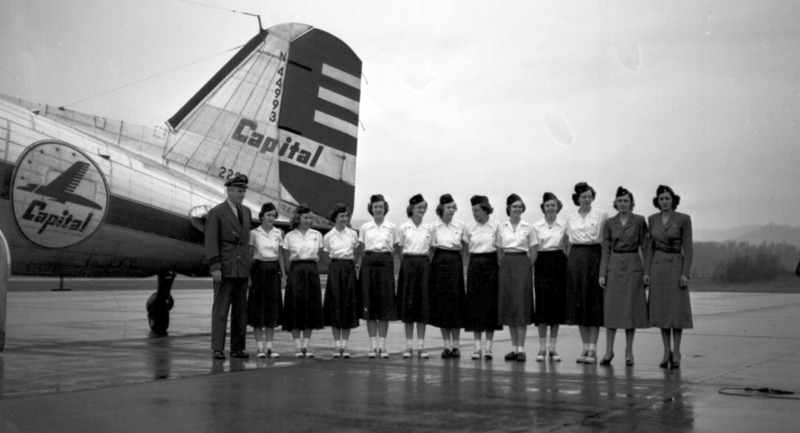 "began after WW2 & was provided by Delta Airlines, Capital Airlines, and Piedmont Airlines. Asheville was one of the enroute stops on Piedmont's inaugural service from Wilmington, NC to Cincinnati, OH." A March 1950 aerial view looking east at Asheville/Hendersonville (from the Pack Memorial Library, via Dallam Oliver-Lee). 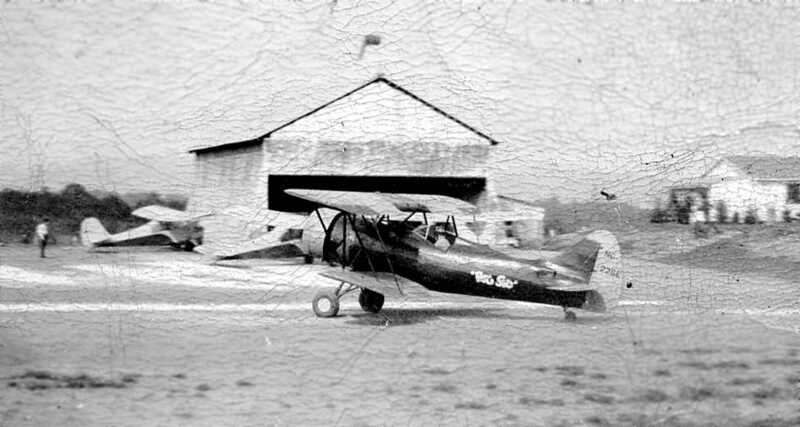 and several small planes parked around a hangar with “Esso” painted on the roof at the bottom-right. A 3/12/50 photo of Western North Carolina’s first Wing Scout troop at the Asheville-Hendersonville Airport (from the Pack Memorial Library, via Dallam Oliver-Lee). The scouts were receiving their pins in a ceremony, with their troop leader Anne Shields (2nd from right) who trained fighter pilots during World War II. Note the Capital Airlines DC-3 in the background. and other aircraft in front of the Skyline Airways hangar (courtesy of Mike Whitt). 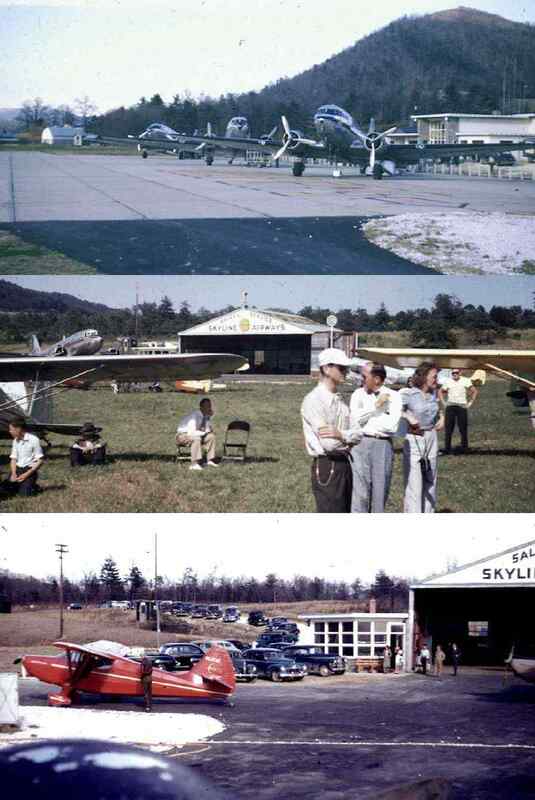 The last dated photos which have been located showing the Asheville-Henderson Airport still in operation was a series of 1954 photos by James Brown. This photo shows a Piper in front of the FBO hangar. James recalled, “I had just gotten my drivers license & I would drive out there to watch the planes. A 1954 photo by James Brown of Asheville-Henderson, showing “a Piper Apache & a Delta DC-3. The Asheville-Hendersonville Airport also had some use in testing of ejection seats. on the main access road from Route 25", according to Hillis "Al" Cunliffe. "My father worked for the Stencel organization from the day it opened it's doors in 1958 until his retirement in 1982. He was one of the original dozen people hired by the company's founder, Fred Stencel. He maintained the 3 different aircraft the company operated to support their R&D efforts." The airplanes were kept the Asheville Regional Airport. Over a period of several years they owned an SNJ-5, a TBM-3 and a Douglas A-26. but the A-26 was the last airplane they had, for only a year or so." around which were clustered a large number of small buildings & a tower (a control tower?). In January 1961 the new Asheville Airport (today's Asheville Regional Airport) was opened 3 miles to the west. The new airport featured a much longer runway, which would be more compatible with modern airline flights. on the January 1961 Charlotte Sectional Chart (courtesy of Chris Kennedy). 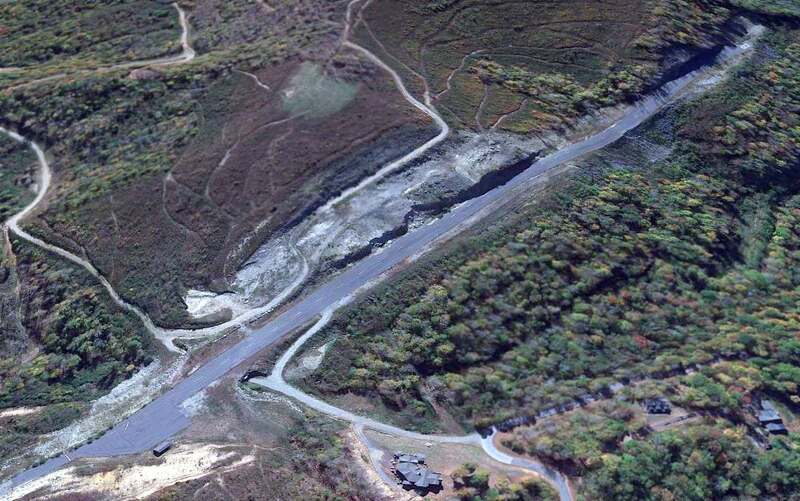 Asheville-Henderson Airport was described as having a 4,100' hard-surface runway. as it was labeled "Abandoned airport" on the May 1963 Charlotte Sectional Chart (courtesy of Chris Kennedy). 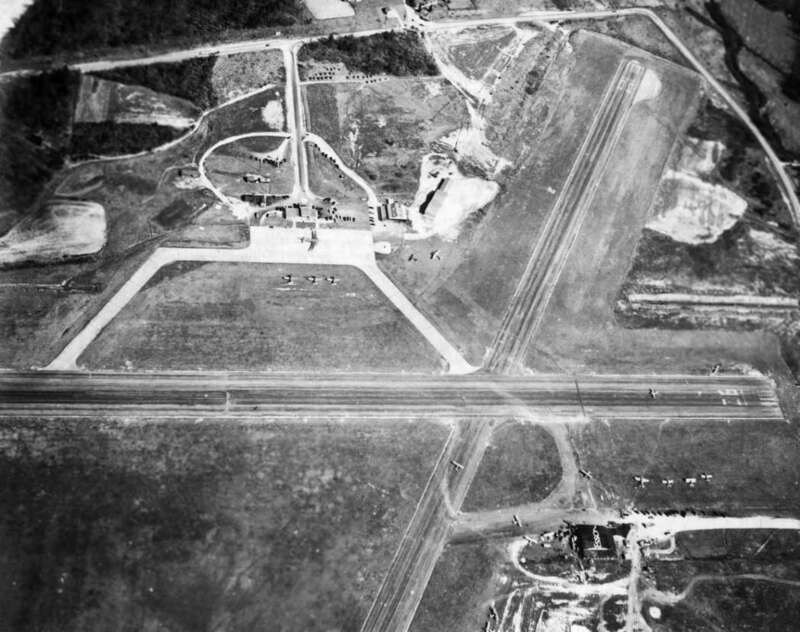 The last photo which has been located showing Asheville-Hendersonville Airport still intact was a 9/24/64 USAF aerial view (courtesy of Dallam Oliver-Lee). All 3 runways were marked with closed-runway “X” symbols, but the field appeared to remain otherwise intact. No aircraft were visible on the field. 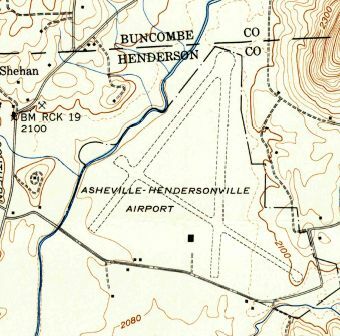 The 1965 USGS topo map (courtesy of Dallam Oliver-Lee) labeled the field as “Asheville-Hendersonville Airport (abandoned)”. it was 'way out in the boonies', no sign of urban development anywhere, horse & farm country." Randy White recalled, “The old Asheville Airport... As a kid the old airport was already closed & I belonged to a radio-control model [airplane] club that used it to fly off of it for several years. My uncle, L.A. White, bought most of the property & turned it into an industrial park & a shop for his trucking business. He loved trains since he and my father were engineers during the war. He installed about a mile of track on the airport property & put an locomotive on it. He used to take us for rides up & down the track. He later turned that into another business, building warehouses with rail access. My uncle wanted to learn to fly so he turned part of the old airport into a grass strip & bought a Cessna 150. After a couple of lessons he discovered that he had an inner ear problem that would not allow him to fly. The 2 instructors that taught my parents to fly eventually went to work for Piedmont airlines. According to Hillis "Al" Cunliffe, "The old airport was used as a drag strip for several years, then became an industrial park." along with another large building adajcent to the south side of Runway 12/30. but additional industrial buildings had been built on the north end of Runway 18. 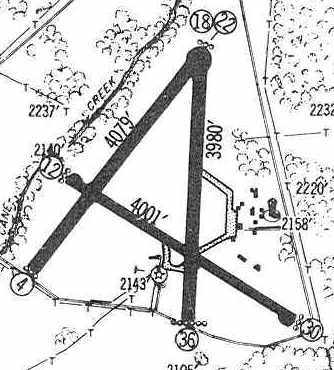 Recent street maps label the property of the former airport as the Cane Creek Industrial Park. 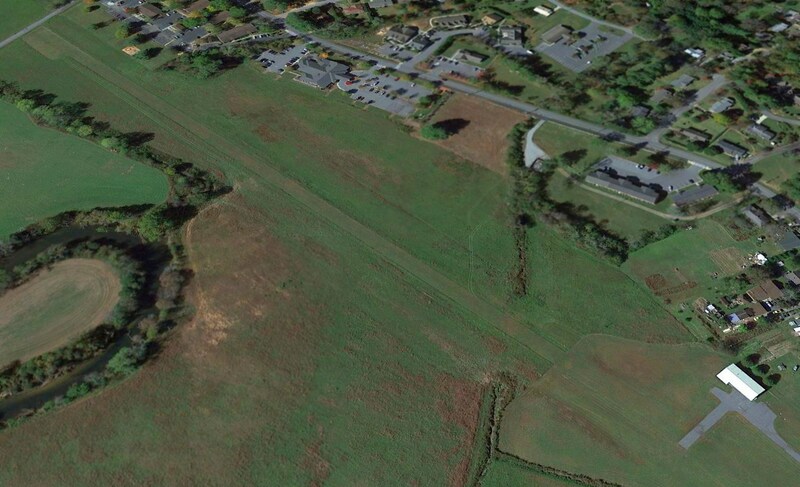 Ironically, as of 2004, a small portion of the site of Asheville-Hendersonville Airport still has some aviation use. The Cane Creek Airport is listed as of 2004 in the Airport/Facility Directory as a private airfield. 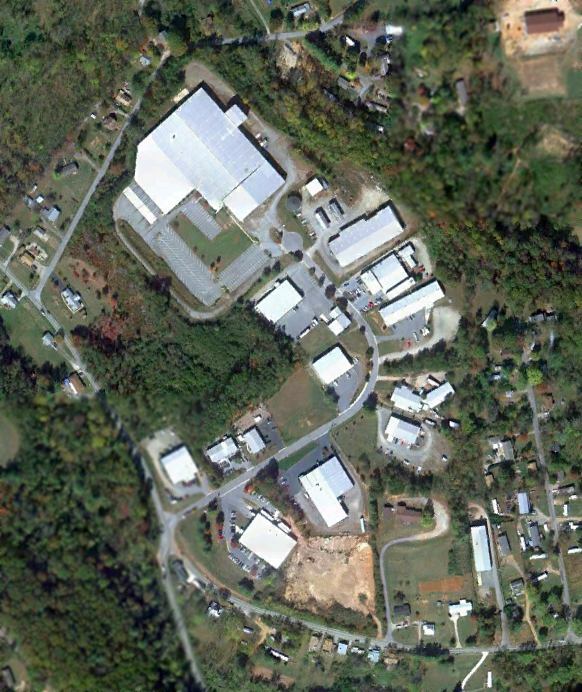 visible immediately adjacent to the northwest side of the large industrial building in the above aerial photo. including 5 single engine aircraft & 2 gliders. 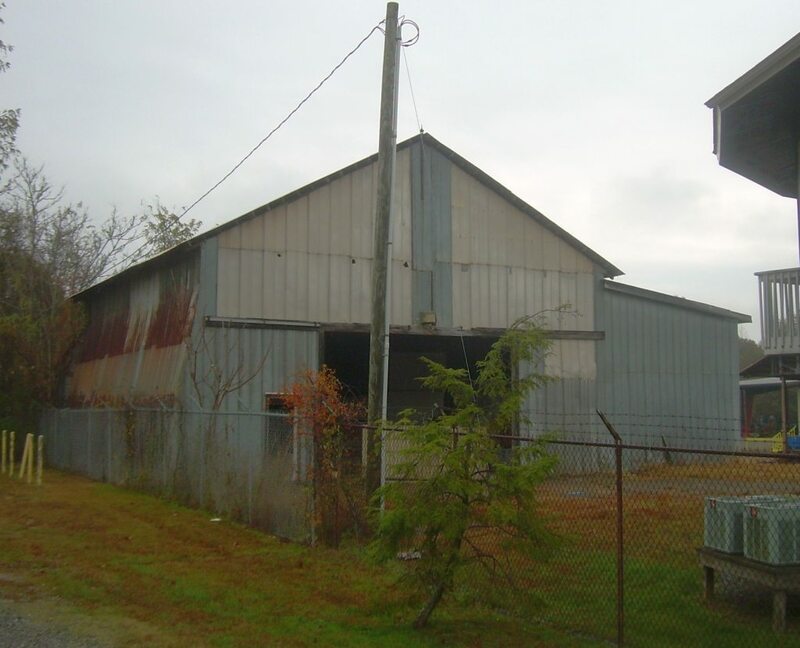 Several small Quonset-hut style buildings just north of the large building may serve as hangars for the field. Thanks to Hillis "Al" Cunliffe for pointing out this reuse of the old field. now covered by an industrial building. A 10/20/10 aerial photo (courtesy of Dallam Oliver-Lee) showed the outline of 3 former runways were still recognizable at the site of the original airport. 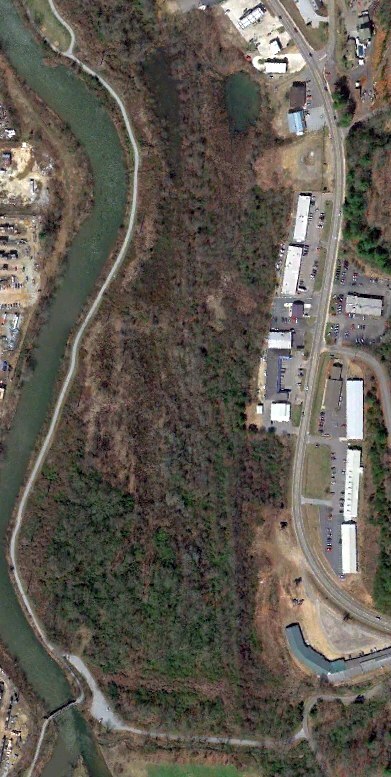 Note the grass runway of the Cane Creek Airport just northwest of the large white building at the center of the photo. A 5/21/18 photo by Liz Spence of “the only place I could find anything left from the old airport. It is the southwestern side of the old airport. There is a path to it from the parking lot of an industrial building by some train tracks through a grove of trees. 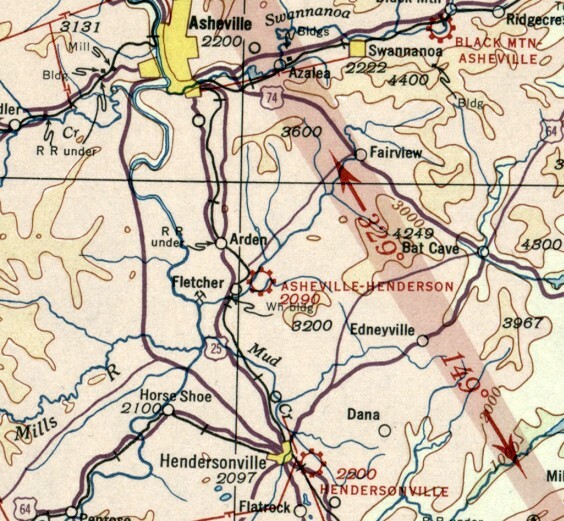 The site of the Asheville-Hendersonville Airport is located north of the intersection of Mills Gap Road & L A White Road. The Lake Logan Airfield, as depicted on the 1979 USGS topo map. The date of construction of this former small private airfield has not been determined, as well as its actual name. or on Sectional Aeronautical Charts from 1948, 1954, 1961, 1966, 1974, 1975, or 1976 (according to Chris Kennedy). 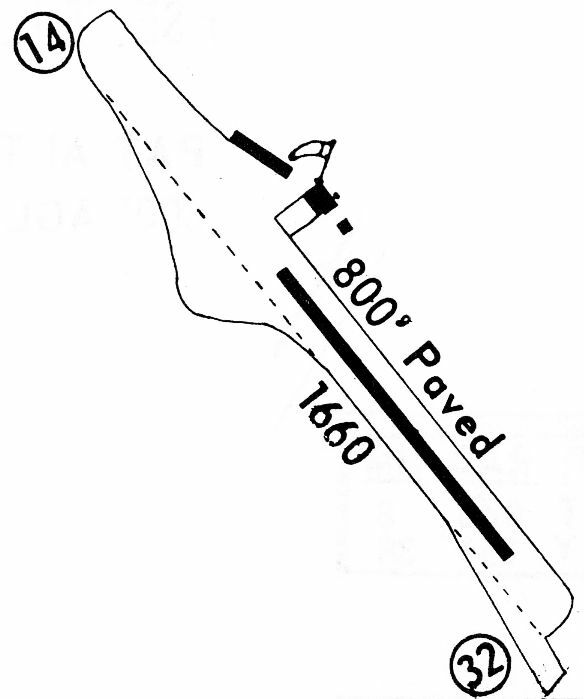 The earliest depiction of this airfield which has been located was on the 1979 USGS topo map. in between Route 215 & the west bank of the Pigeon River. The airfield was not labeled at all. at Lake Logan (lakes, cabins, hunting lodges), and the remains of a concrete landing strip is still there." had a sort of fishing retreat called Lake Logan. At some point they built a very narrow paved strip with a sort of cul-de-sac at one end for turning around. so that one went by the wayside." The date of abandonment of this airfield has not been determined. No airfield at this location was depicted on the 1980 Sectional Aeronautical Chart (according to Chris Kennedy). A 3/24/86 USGS aerial photo (courtesy of Dallam Oliver-Lee) appeared to show the Lake Logan runway. As seen in a 1995 USGS aerial view looking northwest, Lake Logan's single concrete runway was still recognizable. A small group of buildings was located on the west side of the field, but they did not appear to be big enough to be hangars. A 2004 photo by Rod Wright, looking north at the abandoned runway at Lake Logan. has been built by the North Carolina Wildlife Resource Commission [behind the photographer]. Note the obstruction warning balls on the power line. At least the power company figures somebody may try to land there." 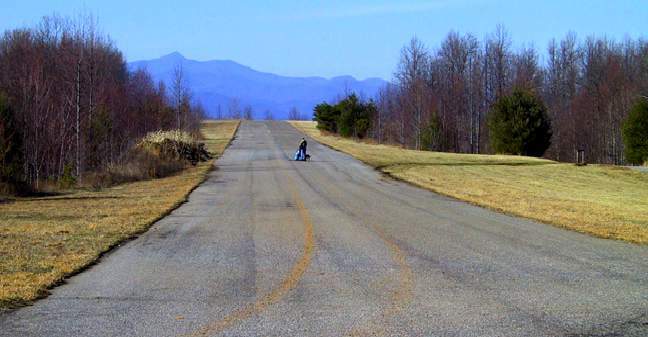 A 2004 photo by Rod Wright, looking south along the abandoned runway at Lake Logan. 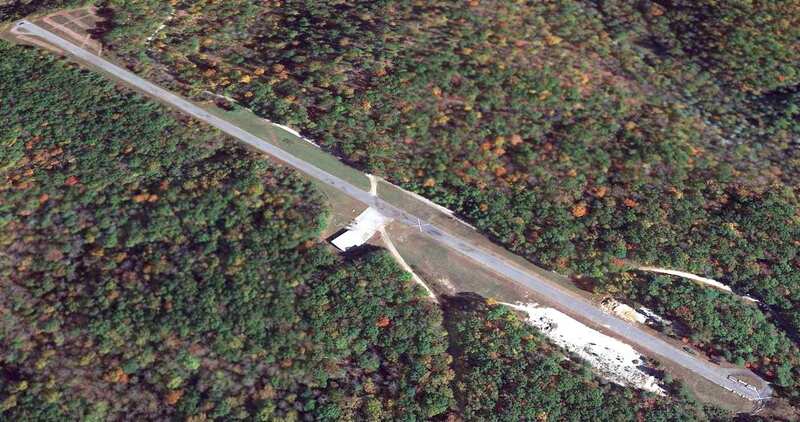 "Note remains of asphalt runway with closed 'X'." "Note the buildings in the distance. The runway curves to the left before the buildings." but the middle portion of the runway had been eaten away by the westward migration of the adjacent Pigeon River. The site of the Lake Logan Airfield is located on the east side of Route 215, just south of Lake Logan. Thanks to Spurgeon McDade for pointing out this airfield. 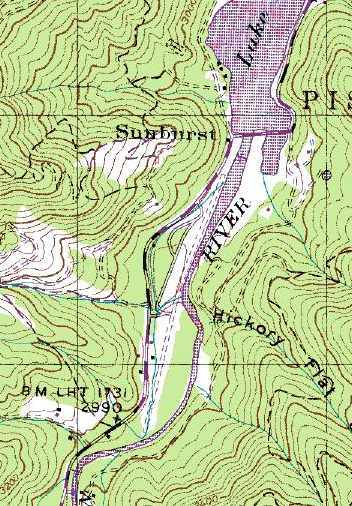 The Camp Summit Airfield, as depicted on the 1965 USGS topo map (courtesy of Dallam Oliver-Lee). as it wasn't depicted on a 10/7/64 USAF aerial photo (courtesy of Dallam Oliver-Lee). 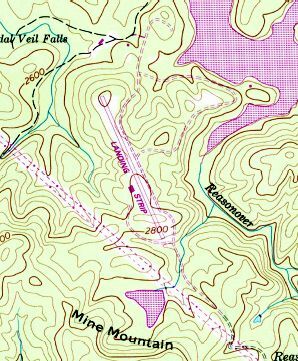 The earliest depiction which has been located of the Camp Summit airfield was on the 1965 USGS topo map (courtesy of Dallam Oliver-Lee). 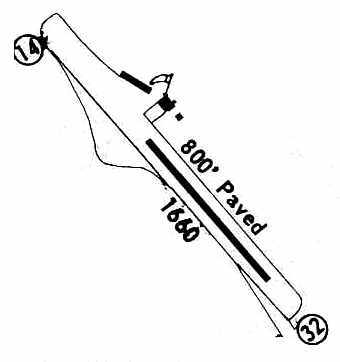 It depicted a single paved northwest/southeast runway, labeled simply as "Landing Strip". the Camp Summit airfield was built as part of a boys & girls camp. 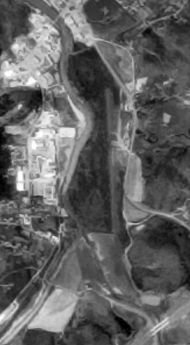 The earliest photo which has been located of the Camp Summit Airfield was a 3/27/89 USGS aerial view (courtesy of Dallam Oliver-Lee). 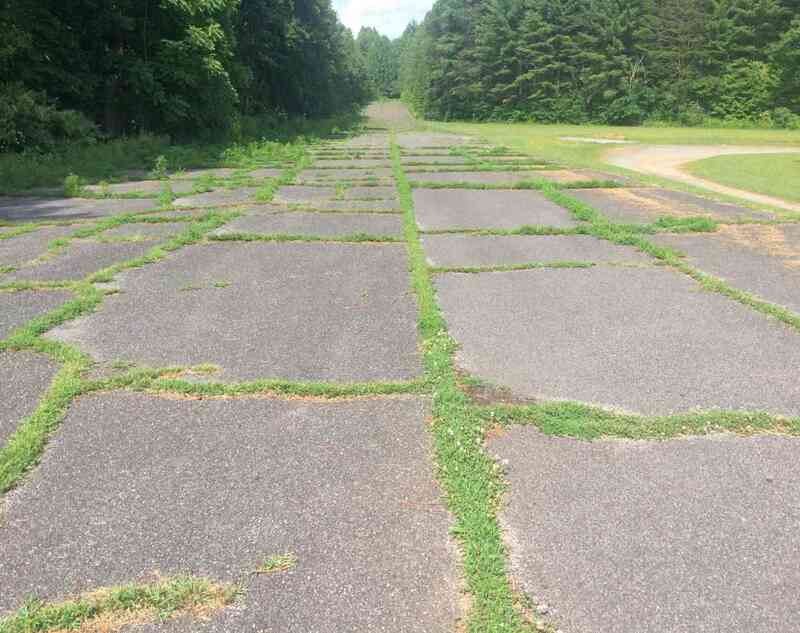 It depicted Camp Summit as having a single asphalt 3,000' runway, with a single hangar west of the runway. 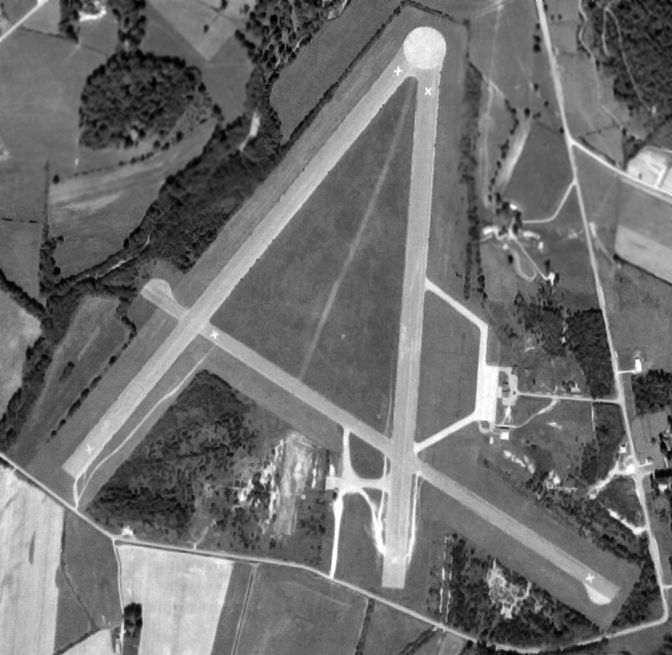 A 1994 USGS aerial view looking northeast depicted the Camp Summit airfield as having a single asphalt 3,000' runway. The airfield had evidently been closed at some point between 1965-94, as the runway was painted with closed runway "X" markings. A single hangar sat west of the runway. A circa 2000s view of the Camp Summit runway, with Mount Pisgah visible in the background. On the 2002 aeronautical chart, the airfield doesn't show up at all (even as an abandoned airfield). and a train was superimposed via CGI going down the middle of the runway. A 2015 aerial view looking northeast showed the Camp Summit airfield remained intact, with closed-runway “X” symbols painted along the runway. 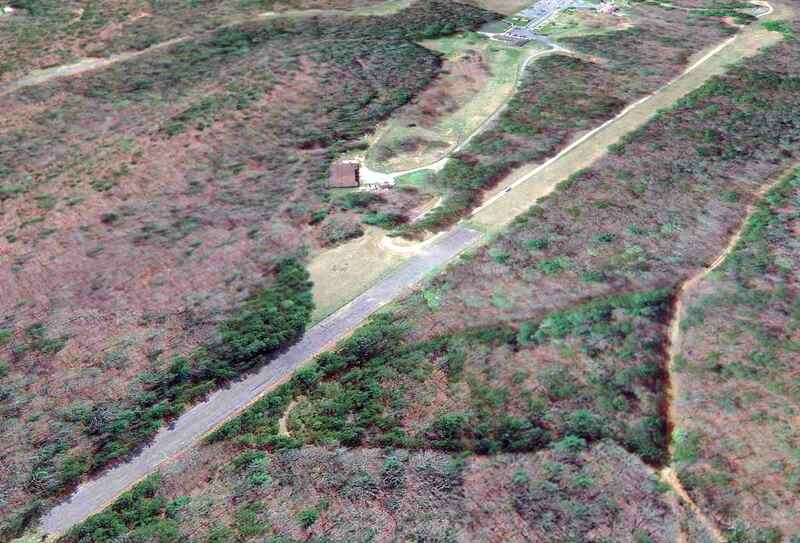 The Camp Summit airfield is located on the west side of Conservation Road, north of Blue Ridge Road.